Rambling RV Rat: When the Best Laid Plans Fail -- Go West or Bust! When the Best Laid Plans Fail -- Go West or Bust! From January through March, we would volunteer at Escapees Rainbow Plantation Park in Summerdale, AL. We would then head to SC to visit our bestest biker bros, followed by various stops along the Eastern Shores, visiting our dearest and truest friends at Misty Lee Farm in South Jersey, and ending up in New York State with Aunt Laurie to celebrate her six scintillating decades of survival and to assist her with household repairs/maintenance. We would then complete a short-term (6-8 weeks) volunteer gig with Great Swamp National Wildlife Refuge in NJ. Thereafter, we had no set plans, but would consider working Peak Season (October – December) with Amazon Camperforce in Murfreesboro, TN, simply because we would already be in that neck of the woods at that time of year. My parents applied to volunteer at Escapees Rainbow Plantation Park in Summerdale, AL back in December 2017, when they committed as groundskeeping volunteers at Escapees Rainbow’s End RV Park in Livingston, TX, for October 1 - December 28, 2018. Yet, Escapees Corporate Park Management would not consider them for volunteers at Summerdale until they completed a 90-day probation period for their volunteer assignment in Livingston. Ironically, their volunteer commitment in Livingston was only to be for 90 days, so Escapees’ probation period would not end until the last day of their contractual term. 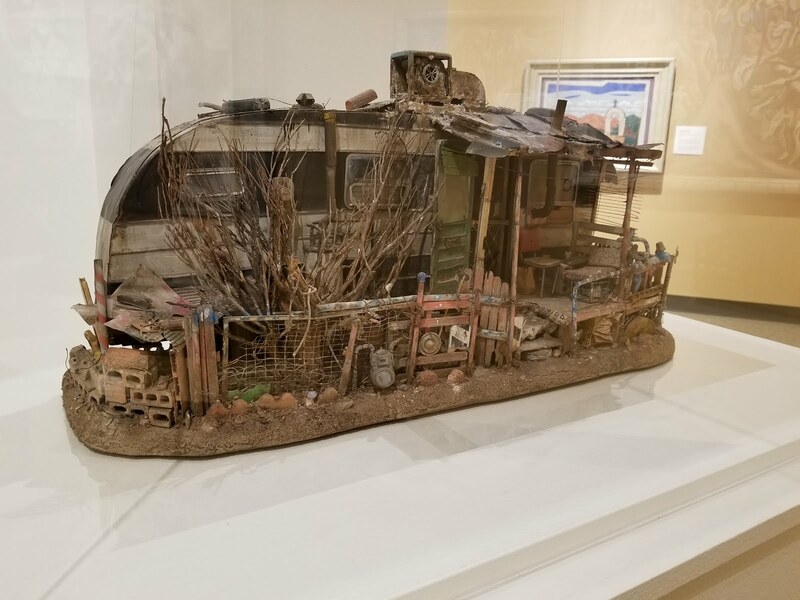 (We heard from many others who volunteered at various Escapee Rainbow Parks that Corporate Park Management will not waive the probation period, even for those who have already been part of their RV Parks volunteer team!) Escapees Rainbow Parks Management did offer my parents the volunteer position in AL, but not until 2 weeks before the end of their probation period/end of their volunteer commitment. Well, no offense, but we don’t wait around that long to put things in motion--we moved on to Plan B. Anyway, I might have a head full of cheese, but I’m having a hard time understanding why volunteers are subjected to “probation periods”. My parents performed quite menial tasks for one full workday a week: picking up sticks/twigs, blowing/raking leaves, hand-mowing, weed whacking, and on two rare occasions, vacuuming and mopping the Activity Center. Not to mention that there is no need for probation periods. Texas is an at-will employment state, so you can be fired, terminated, let go, for any reason, at any time, without any notice. The other fly in the ointment is that Dad must return to TX in March for doctor appointments. No sense starting our Eastern migration and having to backtrack. It is also quite difficult to find campgrounds open before May 1 in the Northeast, especially near Aunt Laurie. And those very few that may be open, subject to weather conditions, would not accept reservations until after the new year. Furthermore, if the government shutdown persists, our volunteer gig in NJ might never come to fruition. With all of these variants, we pushed back the departure time for our Eastern trek. But there was no way we wanted to stay in Livingston beyond the end of our volunteer commitment. We were suffering from hitch-itch and SAD (seasonal affective disorder) with all the dreary, damp, rainy weather. Our Plan B mantra: Go West or Bust! We developed our Western travel routes to include visiting several National Parks, National Monuments, etc., which due to the government shutdown, were then closed. Poor Mom, who tends to be a scheduler and planner, has been as flexible as Gumby and Pokie dealing with all the changes to our itinerary. But we sure have been having fun! 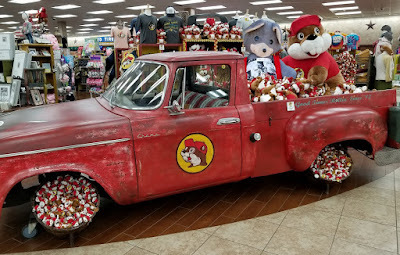 Upon leaving Livingston and after driving in rain for several hours, we stopped at Buc-ees outside San Antonio. What an experience! I have never seen such a huge travel center with everything you could possibly want or need in one store! Clothes (Dad got a few Longhorn shirts and hoodies), food, gifts, and the cleanest and largest restrooms EVER! I loved meeting good old Buc-ee himself! This place definitely earns one of my 5-cheese awards! Back on the road near Columbus, TX, we passed a sign that said Colorado River. How could that be? It turns out this is another Colorado River. 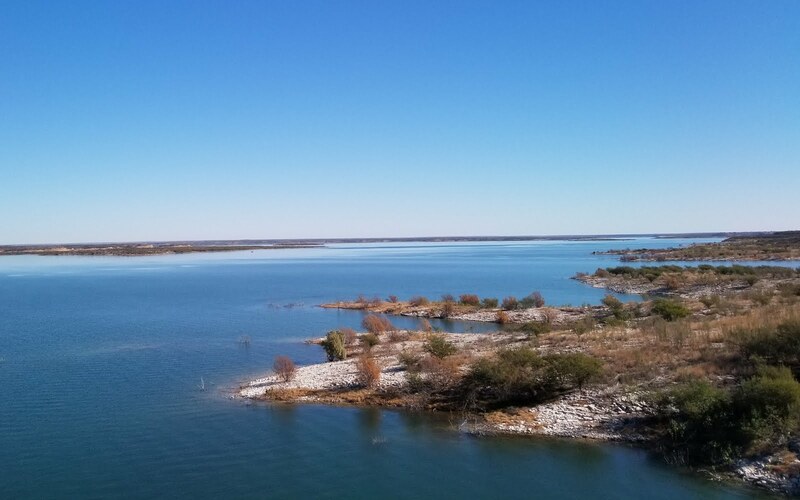 At 862 miles long, it is the 18th largest river within the U.S. and has the distinction of being the largest river lying entirely within the state of Texas. We stayed two evenings at the Lone Star Corral, an Escapees 55+ Adult Co-op in Hondo, TX. This is not an Escapees Rainbow (Corporate) RV Park, but instead is owned and operated independently by Escapees members. Quite frankly, it is much nicer and better maintained than the Escapees Corporate Rainbow Parks we have visited thus far (including Rainbow’s End where we have our leased lot). The Co-op has all wide, paved roads. All the sites are 50 X 70, level, and properly graded for water drainage. They have a clean, inexpensive laundry room with newer washers ($1 wash, 75 cents for dry), and a nice clubhouse. The Co-op has free Wi-Fi! It is only 45 minutes outside San Antonio. As we walked along the rural roads surrounding the Co-op, we were so thrilled to encounter no dead ends yet minimal traffic, and best of all, no vicious, attacking dogs like we have in Livingston. 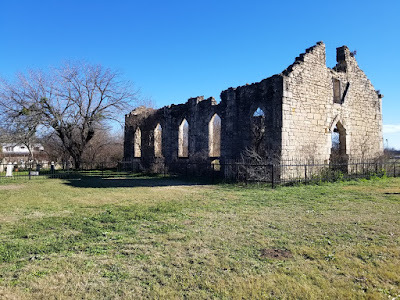 Interestingly, as we walked we discovered the ruins of Saint Dominic’s Catholic Church and graveyard. Now a National Historic District, the church and graveyard were part of the D’Hanis settlement founded in 1847. We left Hondo via US-90. This was much more relaxing and scenic than Interstate 10, but it offers few fuel stops. No problem for us since we were already filled up. We passed the beautiful Amistad National Recreation Area in Del Rio, TX, which represents the confluence of the Pecos, Rio Grande, and Devil Rivers. Due to the government shutdown, the area was closed, so no chance to do any exploring. We encountered the Border Patrol Inspection Station in Comcast, TX. The Border Agents didn’t give us the usual wave through. Instead, we get the hand signal to stop. Oh, no! The interrogation began. “Just the two of you?” Mom, who was driving, responded “Yes”, while the K-9 on duty and I exchanged glances (what am I back here, chopped liver?). “U.S. citizens?” “Yes.” The next question revealed the real reason for our stop: “How’d you get that side X side up on the truck roof?” If only I had a piece of cheese for every time we get asked that question! 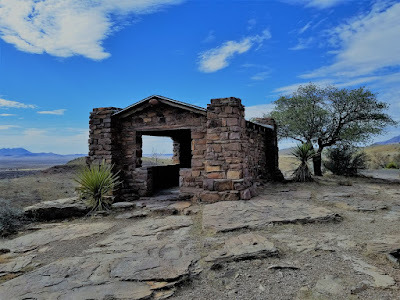 We arrived at Davis Mountains State Park, Fort Davis, TX late in the afternoon. What a gem! Water, sewer, electric, AND cable at our pull-thru site, and Wi-Fi is available at the Interpretive Center. All for just $25/night plus the day-use park entrance fee ($4/person/day). Since we have the TX State Park Pass, the day-use fee was waived and we received one of our night’s at half price. 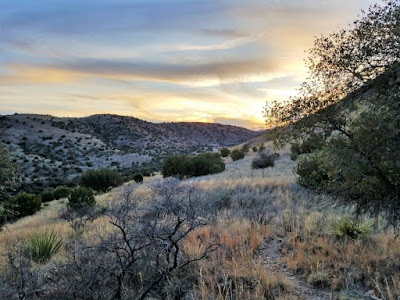 We had just enough time before sunset to complete the Montezuma Quail Trail. 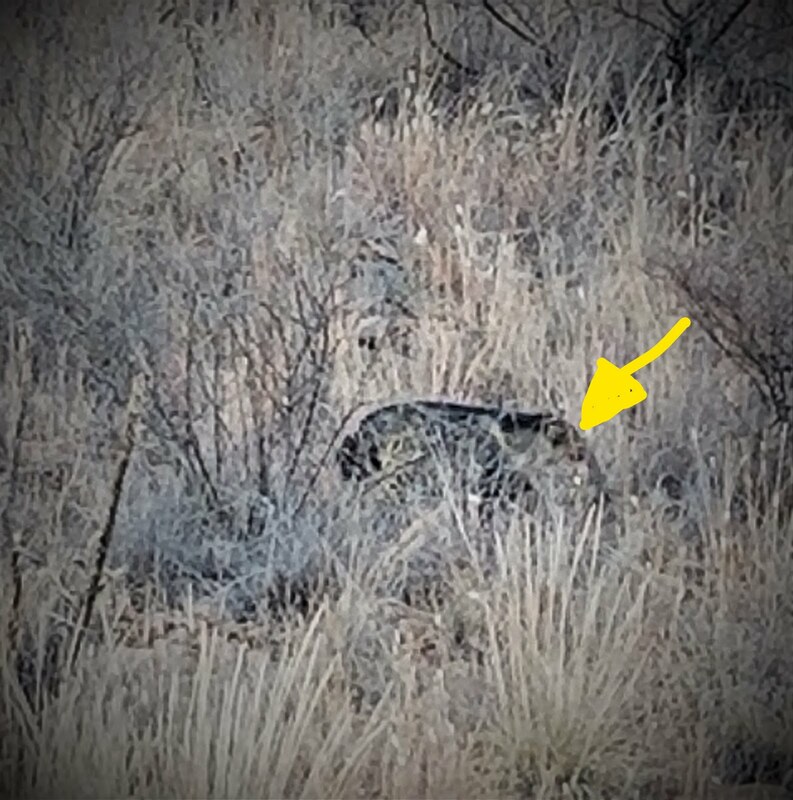 And who was out foraging for dinner: a javelina! I know--it looks like a rock in this photo! But if you look hard, you can glimpse the javelina's eyeball! 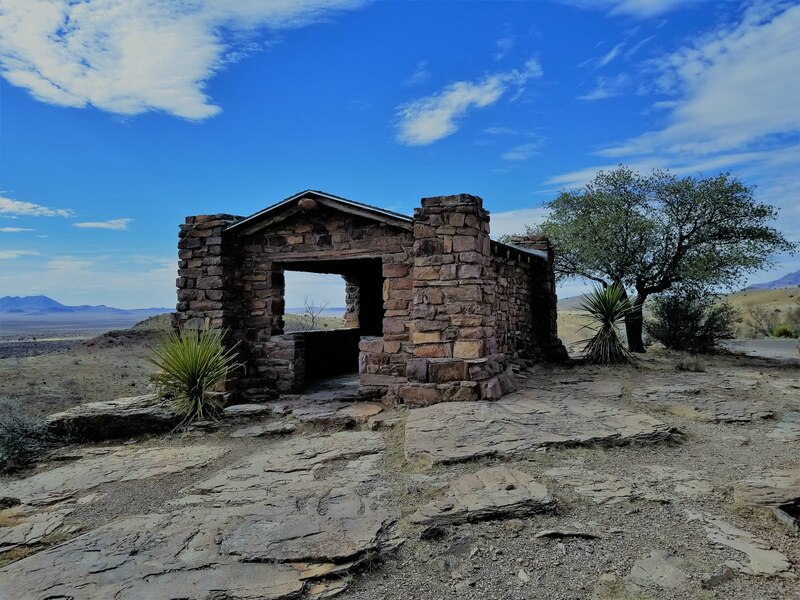 As we explored the Park and hiked along CCC Trail and Skyline Trail, we witnessed the work efforts of the Civilian Conservation Corps (CCC). 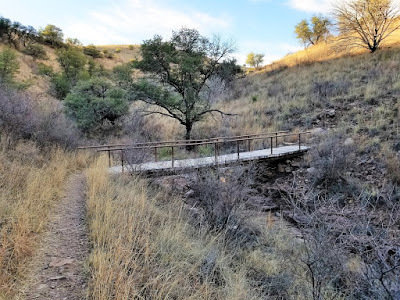 We also noticed lots of javelina poop, though no sightings of any on these treks. 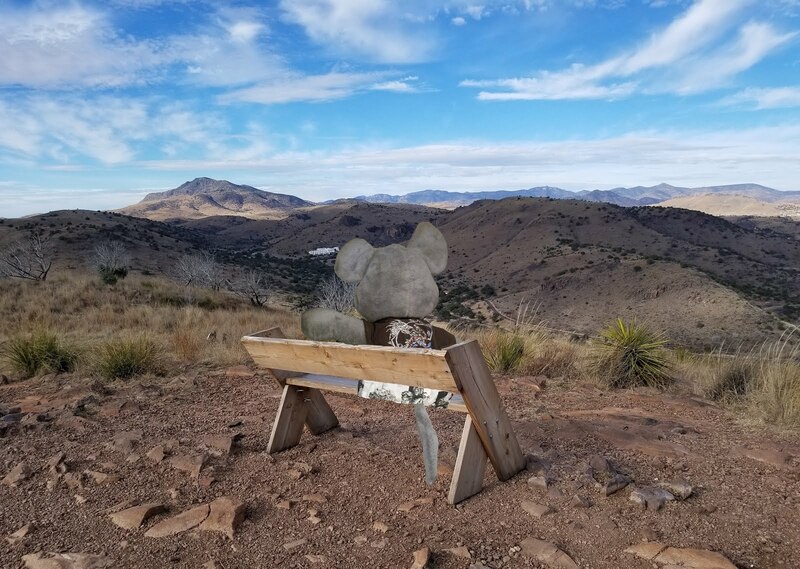 Ranger Rick told me there are mountain lions and bears within these mountains, too! We planned to take the trail that connected to Fort Davis. Established in 1854, Fort Davis is said to be one of the best examples of a Southwest US Army fort. But alas, Fort Davis was blockaded from visitation due to the government shutdown. I did snap a few photos from outside the barricade. 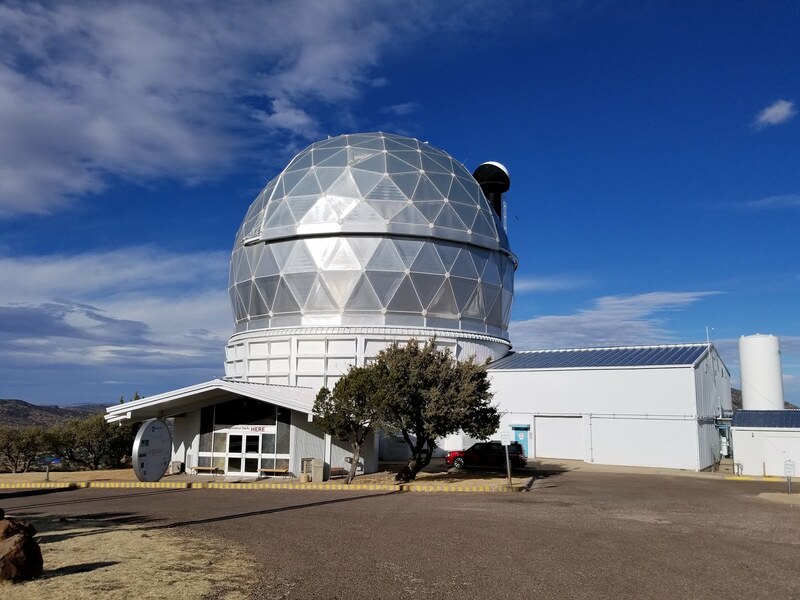 Luckily, Davis Mountains State Park is near McDonald Observatory, a Research Facility for the University of Texas at Austin Astronomy Program. Though open daily, we learned upon arrival that they only run programs twice a day, and we missed both of them. So Mom didn’t get to see any film, a major disappointment for her, and I didn’t get to take any official tour. But we perused the Visitor Center and took the self-guided tour. Driving Spur 78 provided scenic overlooks and panoramic views of Mount Livermore, Davis Mountains’ highest peak at 8,378 feet above sea level. 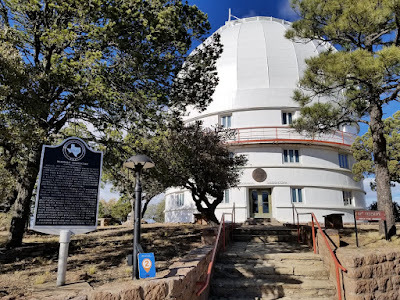 The first of several telescopes built within the observatory, the Otto Struve was the second largest telescope in the world at the time of its dedication in 1939. It is situated on the summit of Mt. Locke, which at an elevation of 6,791 feet, is the highest point on Texas highways. 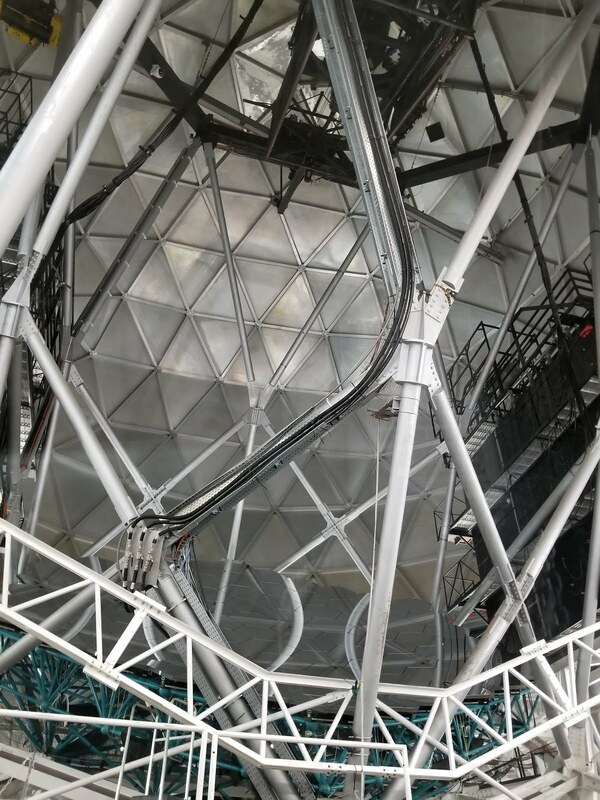 We visited the sites of several other telescopes within the complex, including the Hobby-Eberly Telescope, which is operated by 2 German and 2 U.S. universities. 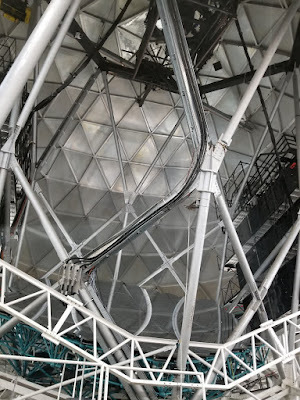 Here, we got to see the inner workings of the telescope, which was very cool. Well, closing time at the Observatory was fast approaching, and the blustery winds were howling at these high elevations. So we ended our tour. 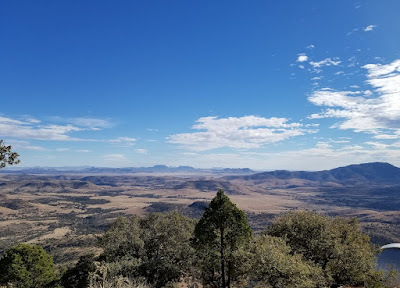 We thoroughly enjoyed our stay at Davis Mountains State Park, and we sure have gotten our money’s worth out of our Texas State Parks Pass! We hit the road at 9 a.m., taking TX-17 to our next destination of Roswell, NM. TX-17 consisted of miles and miles of open range, where I glimpsed the deer and the antelope at play. 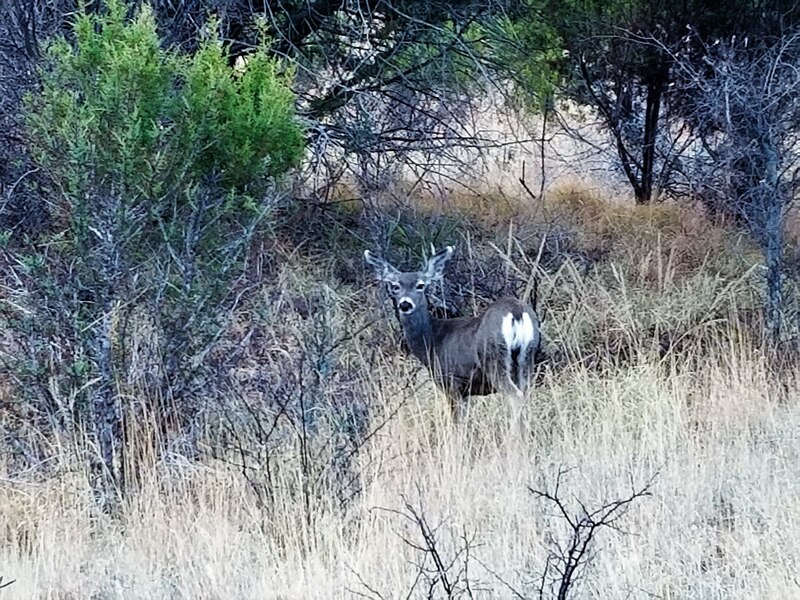 We then found ourselves in Pecos, TX, so we stopped to check out Tra Park, another one of Escapees Corporate Rainbow Parks. 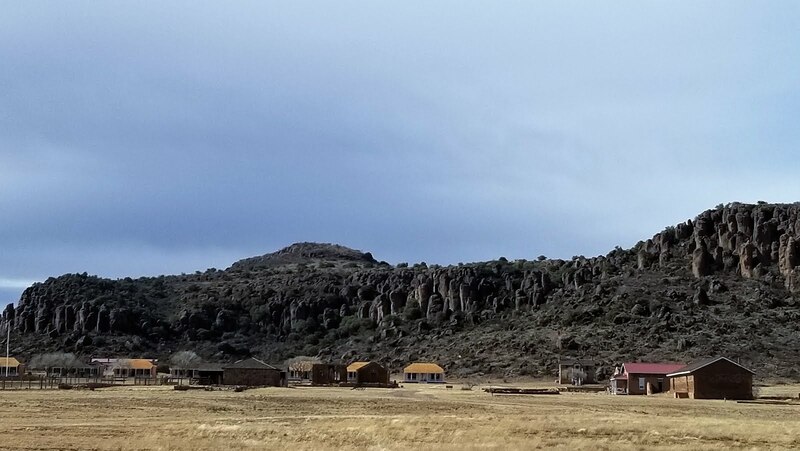 I now know why Escapees stopped advertising this location: it offers bare bones, parking lot type accommodations, and most of the sites are occupied long-term by oil industry workers. It’s not exactly a bargain either at $25/night for Escapees members, $28 for non-members. About the only thing it has going for it is that it has easy access to Interstate 20 and the office staff is pleasant and helpful. 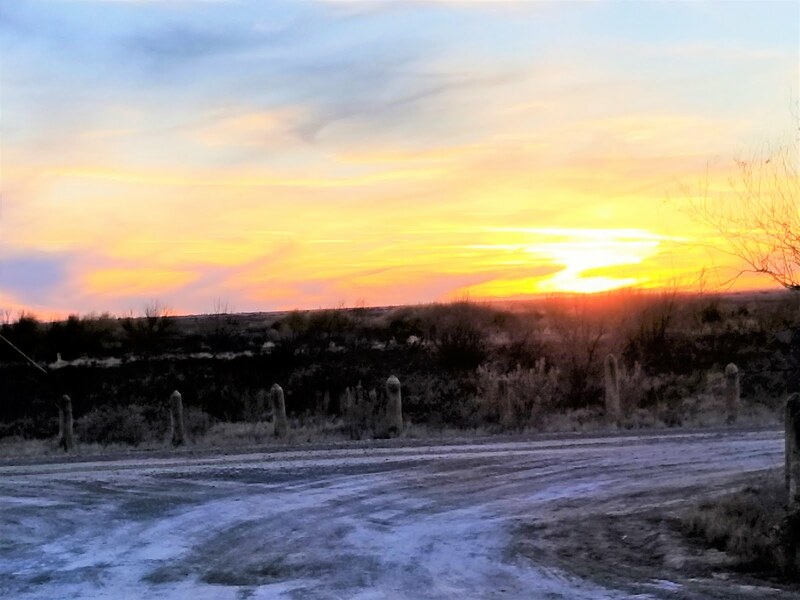 As we continued our journey, the vistas of TX-17 disappeared, replaced with muddy, dusty, industrialized oil rigging fields and road construction along TX-285. Yuck! 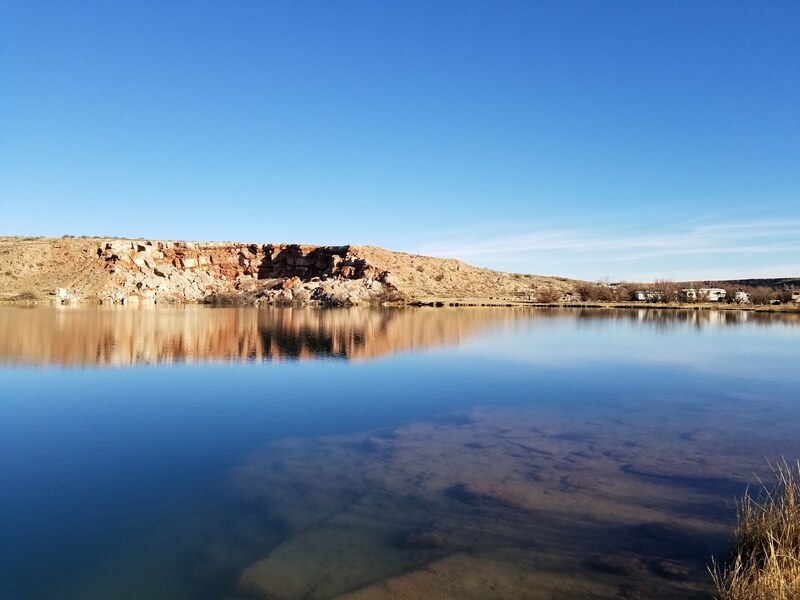 We arrived at Bottomless Lakes State Park outside Roswell, NM. It, too, provides a wonderful RV Park experience! We had a ginormous pull-thru site, big enough for two set-ups! 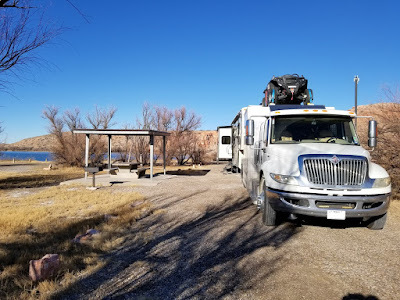 Our site had 30 amp electric and water, with a dump station available, and a view of Lea Lake for only $14/night plus $4/day use fee for out-of-state non-annual pass holders—a steal! 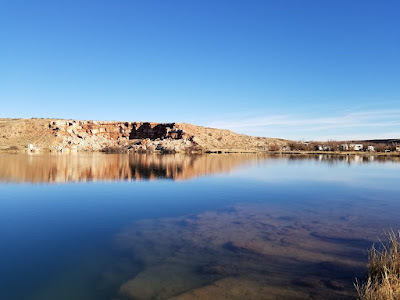 Bottomless Lakes, established in 1933, was the first State Park in NM, and its name refers to the 9 water-filled sinkholes along the Pecos River Valley. Immediately after we set-up, we headed out to explore. During the summer, Lea Lake must be a hot-spot. You can swim, rent paddle boats and canoes, and it is popular for cave diving. Lea Lake, the largest of the 9 water-filled sinkholes. 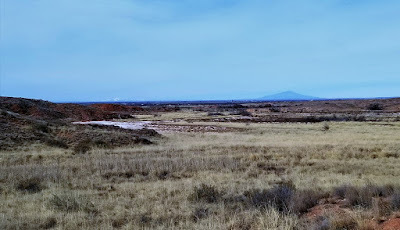 Beyond Lea Lake, we hiked the Bluff Trail, which leads to several of the other sinkholes. The sign said the trail was “teeming with wildlife”. By now, I know the drill—this means I will see squat, nada, zippo, zilch when it comes to animals. 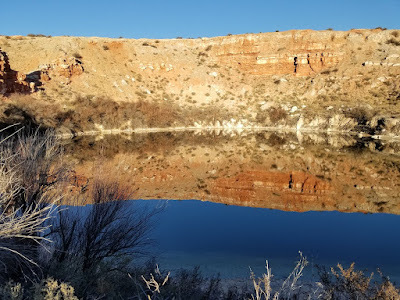 Nevertheless, we did enjoy the tranquility of being the only humans on the trail and were enthralled with the reflections of the colorful rocks in the waters of the sinkholes. We returned just in time to witness an awesome sunset. Reflection of the rocks in the waters of Mirror Lake, another of the water-filled sinkholes. 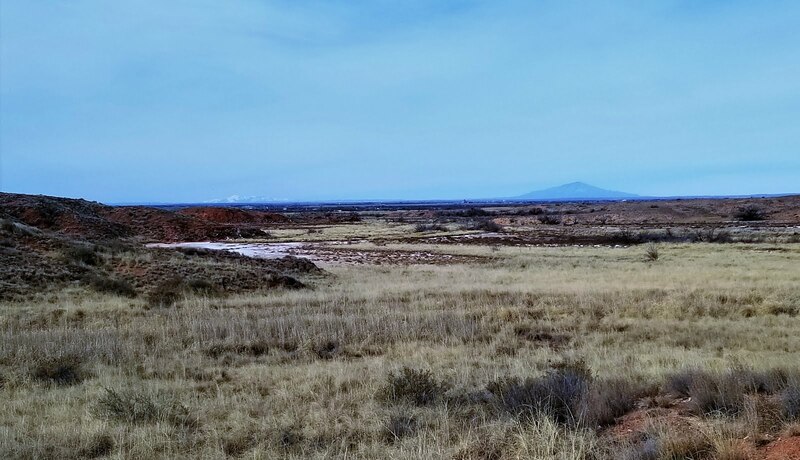 The next morning, we enjoyed a leisurely stroll along the Wetlands Boardwalk, viewing the Capitan (right) and snow-capped Sacramento Mountains (left) way in the distance. Then we headed to the Visitor Center, which was closed, despite the sign saying it was open from 8 – 4. We left the truck parked there and continued to walk along NM-409, which lead to Lazy Lagoon, another one of the bottomless lakes. Well, according to the map, we weren’t too far from the Skidmarks Hiking/Biking Trail, which itself was an easy 3-mile loop. OK, let’s head that way I said. I realized after we arrived at Skidmarks Trail that the map I was using was not-to-scale! Long story short, by the time we completed our hiking and returned to the truck at the Visitor Center, we clocked more than 8 miles! We were on our way into Roswell before sun-up, hoping to catch some aliens off-guard. 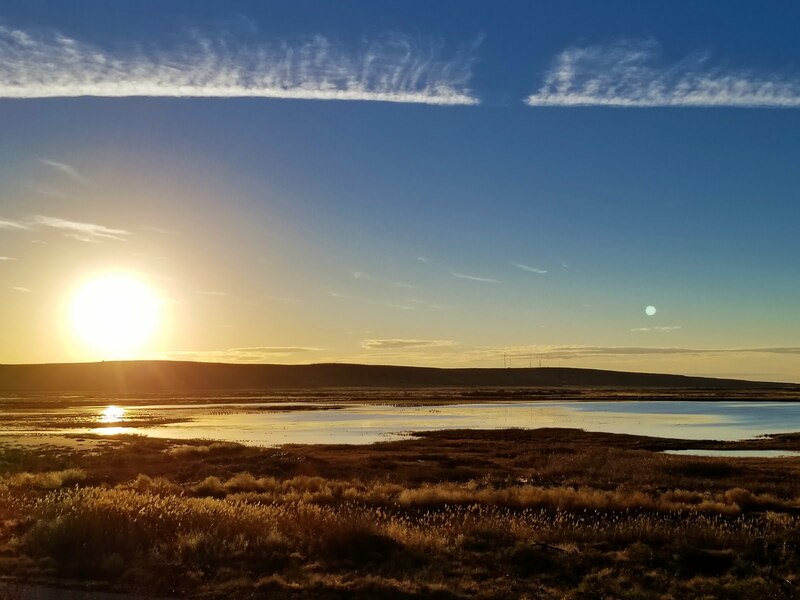 Our first stop was to Bitter Lake National Wildlife Refuge. Though their Visitor Center was shuttered, their entry gate was open and the sign informed us we were allowed on premises, but at our own risk—no personnel were on site to assist should we get in a pickle. OK by us! 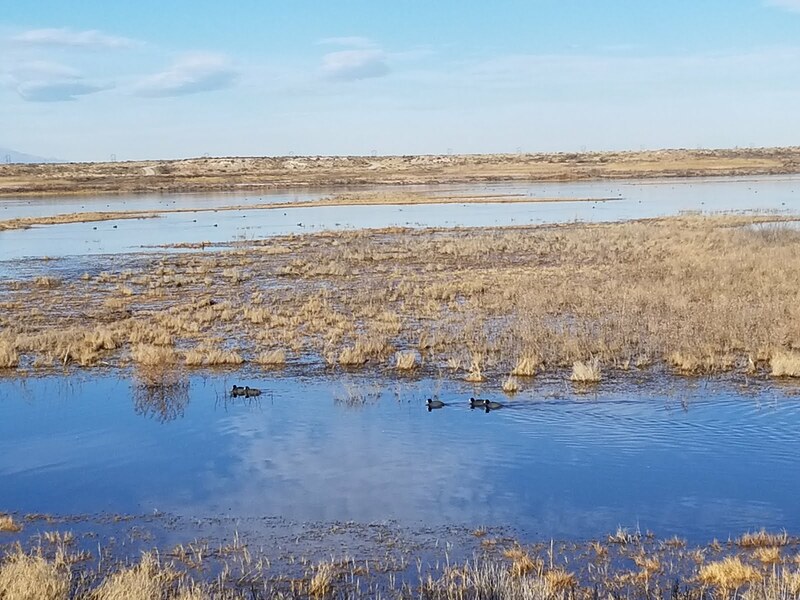 We traversed along the 7-mile driving tour, spotting various waterfowl like sand cranes. The Refuge is home to more than 90 species of dragonflies and damselflies. Though I didn’t see any, I’m sure they were there watching me. You see, damselflies lay their eggs in the water. When the babies hatch, they stay underwater to live for up to 6 years before they come up to say hi! 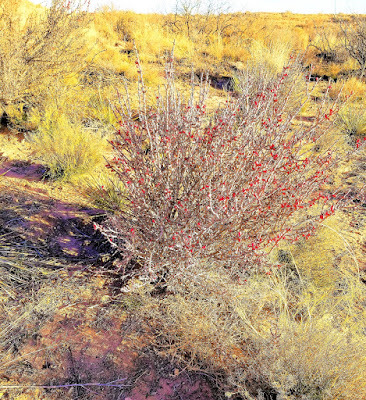 We did the short nature walk, Desert Upland Loop, where I saw a cuddly cottontail rabbit and a pretty Desert Christmas Cactus in bloom. 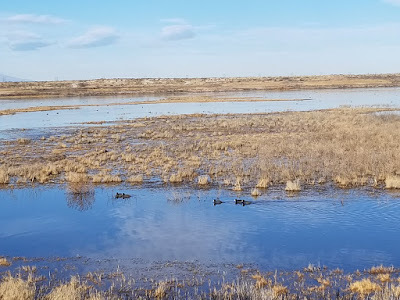 Then we hiked along the Oxbow Trail, a 2-mile loop within the wetlands. There were lots of duckies, though I’m not sure whether they were dabblers or divers. 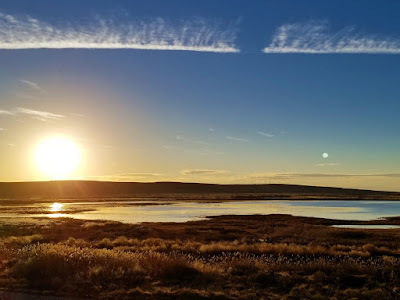 As we left the Refuge,we saw a ginormous solar farm, its 600,000 pivoting panels producing enough energy for 40,000 homes. Perhaps an alien would be hiding here? Nope, no sightings. 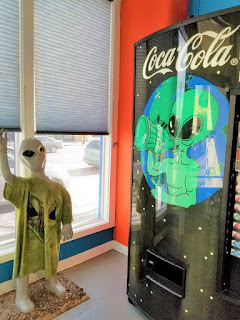 We found Roswell to be a fun, cheesy town! 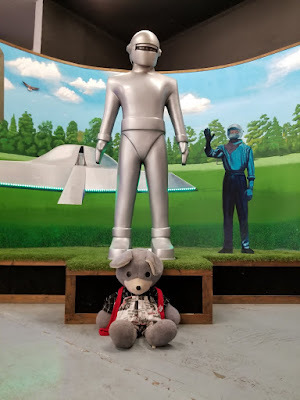 We started at the Visitor Center, where the friendly, informative staff provided us a free family photo with a few “locals”, who I am quite certain may be some distant relatives of ours. We got complimentary bumper stickers, stress balls, snacks, and great info on how to maximize our alien experience! 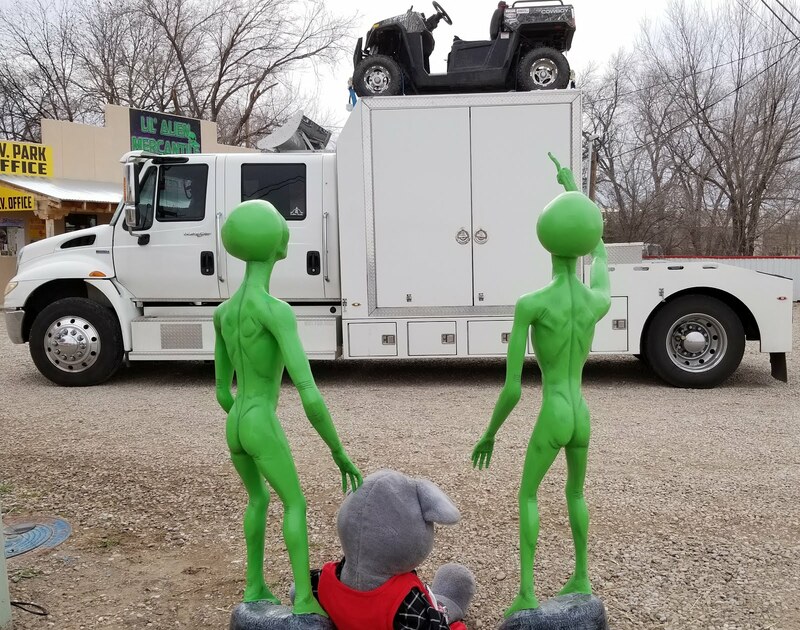 We parked the truck and headed toward the UFO Museum. 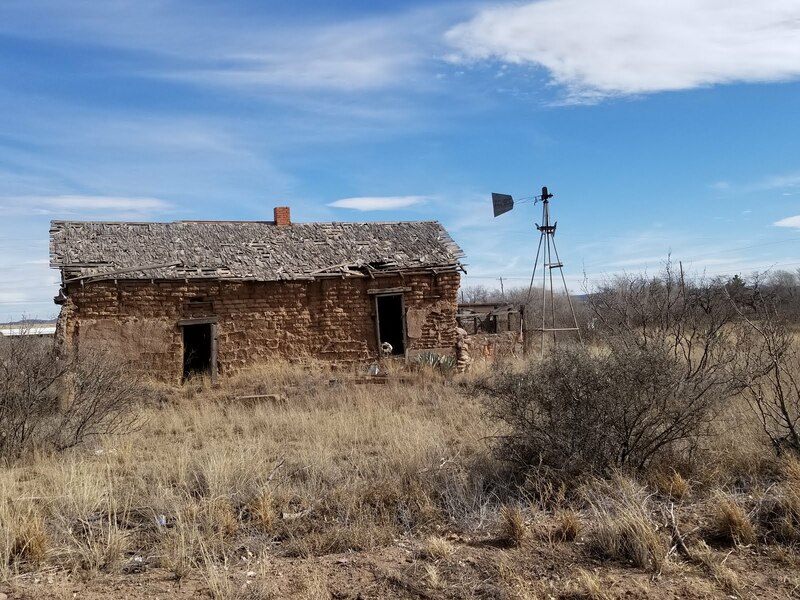 This whole town’s tourism was built around an incident in July 1947, when a rancher heard a loud noise and later discovered debris and strange-looking materials strewn across an area as wide as a football field and almost ¾ of a mile long. Over the course of a week, some weird things occurred. 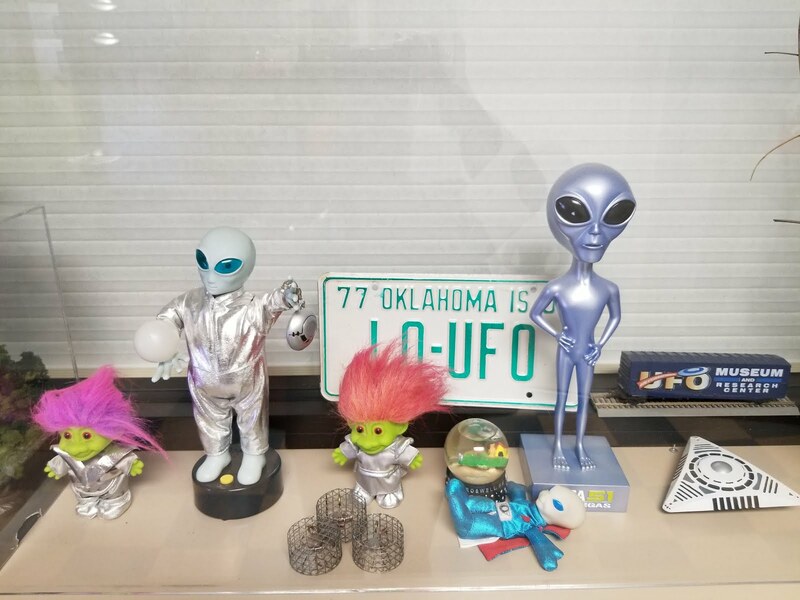 Like the Roswell Army Air Field personnel asking the local funeral home for child-size caskets and inquiring how to preserve bodies that had been exposed to weather. Like some of the debris the rancher collected and handed over to Roswell Army Air Field personnel suddenly is removed and replaced with pieces of a weather balloon. UFO--fact or fiction? On one hand, I think it is pompous and presumptuous to think Earthlings are the only lifeforms in the universe. Maybe the other planets in our galaxy were God’s “testing grounds”? And I have no problem believing the government tried to cover up an encounter with extraterrestrials. Conversely, I know that the more you tell a story, the more embellished it gets, and it seems odd to me that the “facts” regarding this incident didn’t come to light until 30 years after its occurrence. 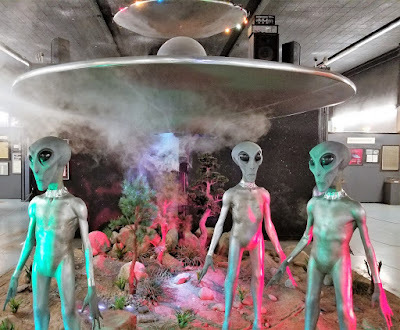 UFO—fact or fiction? What do you think? We walked back to the truck, snapping photos of all the aliens we encountered. They reside outside eateries, fuel stations, and are even on the street light posts! While many businesses and attractions embrace the UFO legacy, there are many other types of things to do within Roswell. Roswell has a zoo, several art museums, and a historical society exhibit hall. All are free admission, but donations are accepted and appreciated. 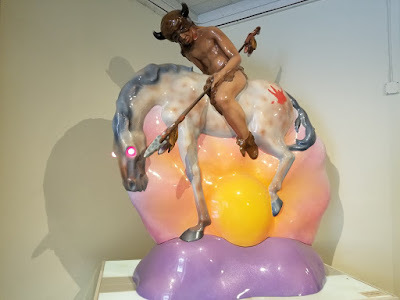 I gladly parted with my cheese money as a donation to visit the Roswell Museum and Art Center. Its exhibits were intriguing, representing a variety of mediums, topics, and talents. 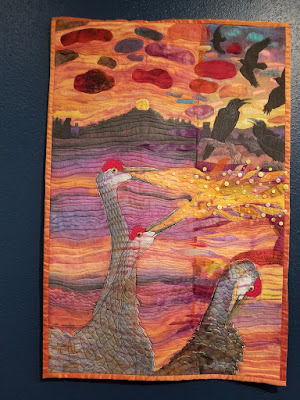 The fabric art was especially interesting, and it immediately brought to mind friends like Barbara and Carol who do quilting, which is surely an art form as well as a labor of love. 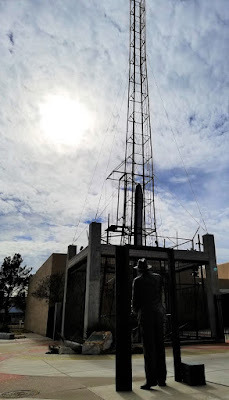 The Museum also houses the Robert Hutchins Goddard exhibit and Planetarium. Goddard was the father of rocket science, though his beliefs that a rocket could reach the moon earned him ridicule and embarrassment. 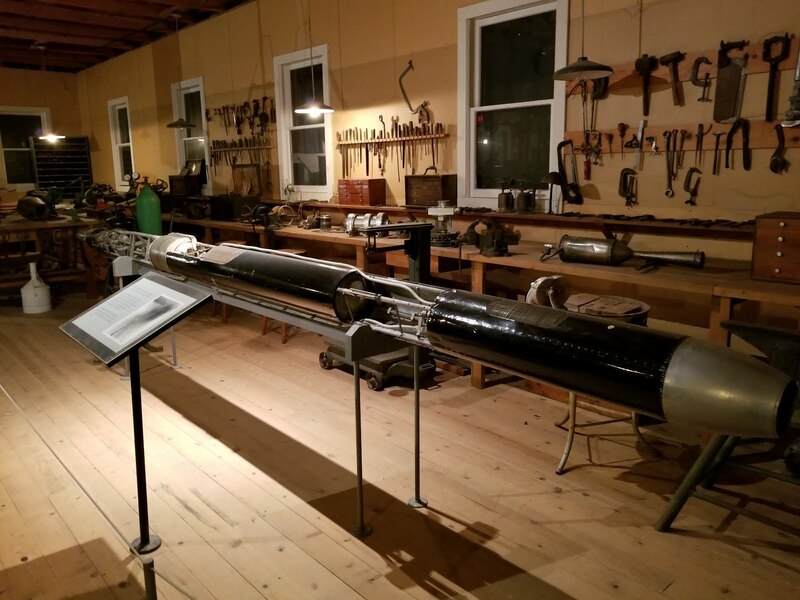 Goddard continued to experiment with rocketry and meticulously documented the test results, but he never again shared the information publicly. In fact, it was not until after his death that his widow had his papers published, and he received 75% of his patents posthumously. His widow was some smart cookie—she sued the government for using her husband’s inventions and discoveries, and in 1960 was awarded $1 million for patent infringement. But most importantly, she ensured her husband--the dreamer, tinkerer, and rocket pioneer--got his much-deserved recognition for his contributions to rocket science. Statue of Goddard with replica of his rocket invention. Goddard's workshop with samples of his early rockets. 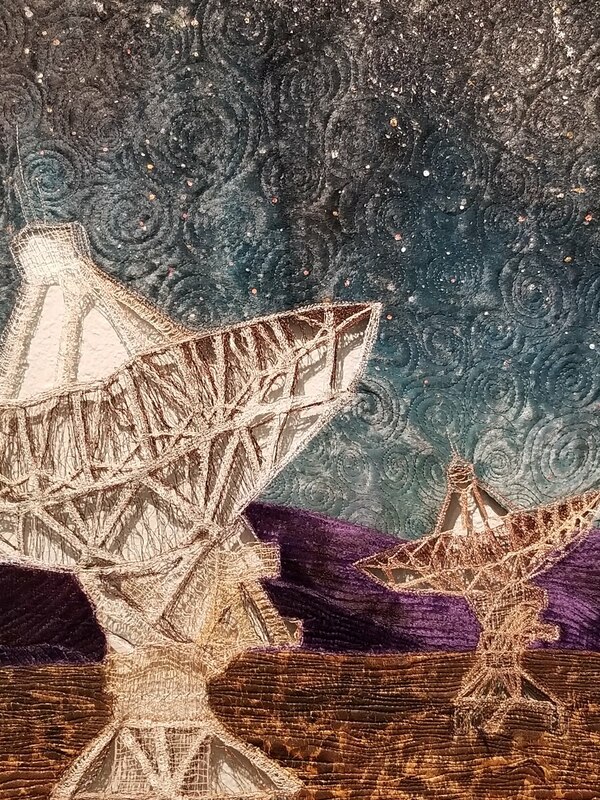 We also attended the showing at the Goddard Planetarium. This came with a fee of $5/person for out-of-state visitors, but it was well worth it. The 45-minute show discussed the NASA satellite IBEX, Interstellar Boundary Explorer, which was launched in 2008. It is designed to explore the outer bounds of our galaxy. Very cool stuff! 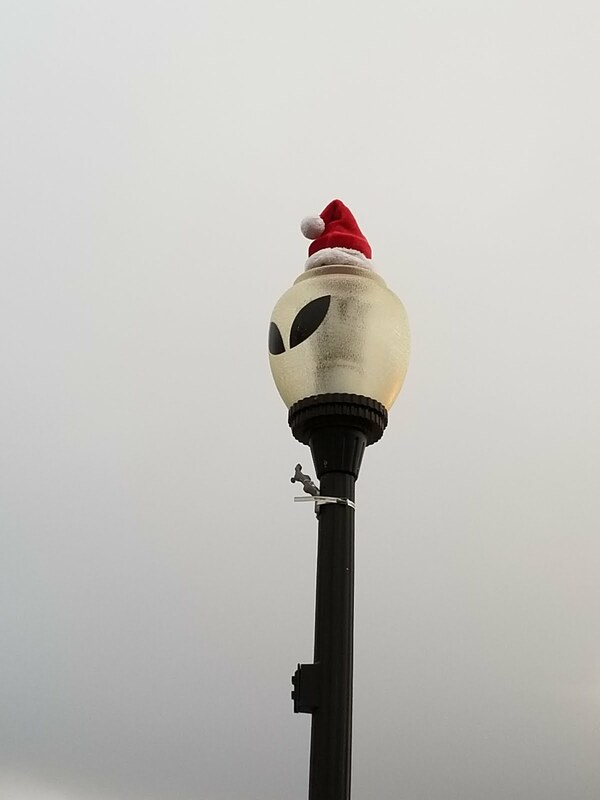 We walked through Roswell’s Historic District, returning to the truck quite exhausted. It was a busy day, and I was ready to crash. But not before getting one final photo op! I left Roswell, with many warm, fun-filled memories. 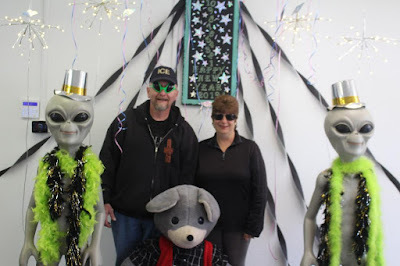 Me, clowning around with the space aliens. The next morning, we got back on the road. 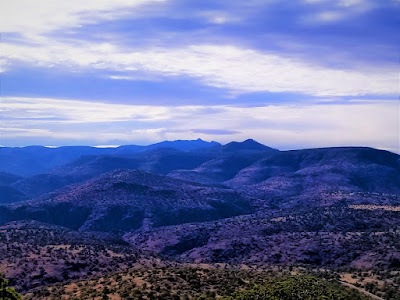 Traveling in Lincoln County, NM along US-70, we passed through the homelands of the Mescalero Apache Tribe. It was time for Mom to take over the wheel, so we stopped at one of several of the casinos along the route. I wanted to press my luck, but Mom held on to my cheese money purse strings. 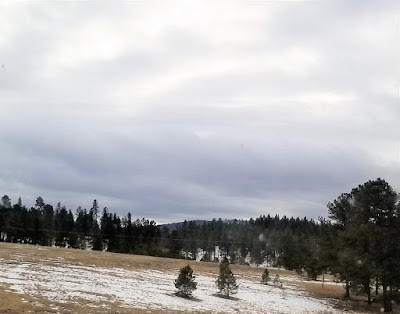 I nodded off for just a minute or two and awoke to snow on the ground! I shouldn’t have be surprised since we were at Apache Summit, towering 7,591 feet above sea level. We arrive at our destination for the day: Escapees Dream Catcher Park. This is a small, well-maintained Corporate Park with flat, gravel pull-through sites and easy access on/off Interstate 10. Reasonably priced at $22/night for Escapees members. Though no Wi-FI, the Quality Inn next door has it. The Quality Inn also allows Dream Catcher guests to use their exercise room free of charge. It is very small with just a few machines and free weights, but it provided us an opportunity to get in some exercise on a travel day. We were back on Interstate 10 early the next morning, and we encountered fog for a good portion of the day. 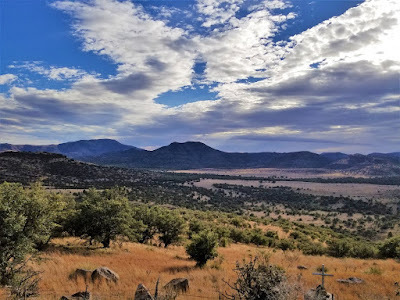 We planned to stay overnight at SKP Saguaro Co-op in Benson, AZ and visit with friends Linda and George. But alas, after spending the holidays in Colorado, they just arrived back and were sick as dogs. We will see them later in the season. But now we figured why not drive all the way to Quartzsite in one day. It is only about 7 hours, and with Mom sharing the driving, not too much of a strain. Phoenix prove to be a nightmare, with bumper to bumper traffic. And this was still early in the afternoon. You could see everyone was ready for the weekend and heading to Flagstaff for some serious skiing. Finally, I see exit signs for Quartzsite, AZ! 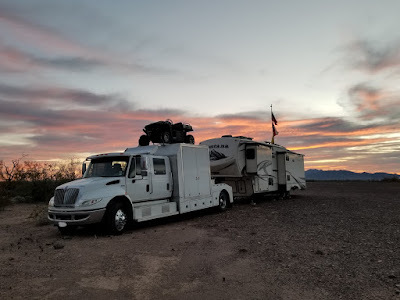 Back for our 5th season and looking forward to seeing friends, attending rallies, participating in dance classes, off-roading, and most importantly, experiencing dry, warmer weather! Good to catch up with you guys! Sorry your original plans fell through but LOVE your Plan B! You sure made the best of it! We also loved Roswell - so interesting to read all about it! Enjoy Q and hope we see you this summer back east! As always, your entries are entertaining and full of life. Good to hear you all three are doing good. Wishing you an amazing trip to the West Coast.